Pop-up tents are becoming very popular among campers. They are easy to setup and store giving you more time to enjoy the outdoors or get ready to go home. As more camping enthusiasts switch to the pop-up tent, others are wondering what the fuss us all about. Here are some benefits of owning a pop-up tent to help you decide if they are the right choice for your camping or backpacking needs. Ideal for camping indoors for kids, because they don’t require tent stakes or poles. There are a lot more pop-up tents available to the consumer than there used to be, and the quality has has improved considerably over the years. The tents listed here handle wind and rain better than most other pop-up tents, but they still don’t stand up to the elements as well as conventional tents in the same price range. Pop up tents can be found in sizes from 1 to 4 person pretty easily, and there are a few manufacturers that make family size pop-up tents for those who need a lot of space. 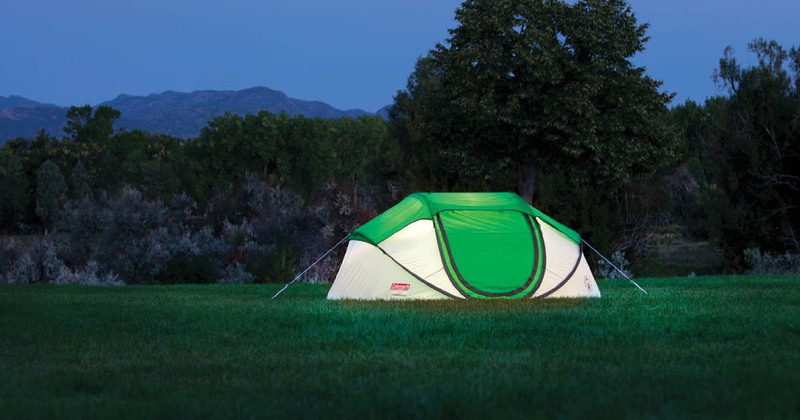 This is by far the most popular pop-up tent on the market. Coleman makes a 2 man version and a 4 man version, and they are both really easy to set up and take down. However the first time you attempt to take it down will probably be a bit of a challenge, and I recommend watching this Coleman Galiano Set-up and take-down video first. 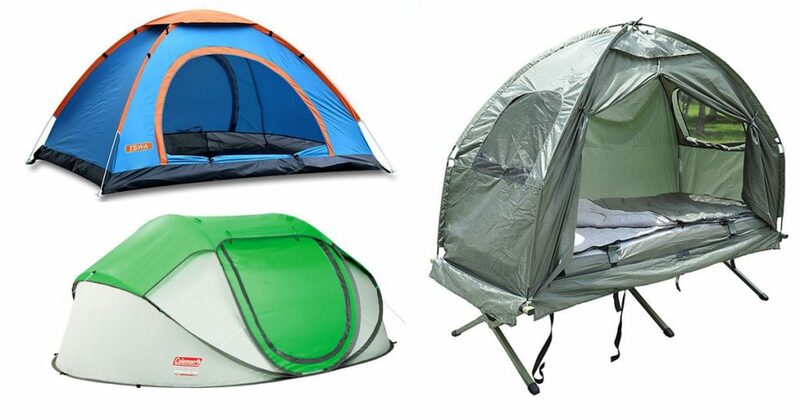 If you plan on using this tent for more than one person, I recommend buying the four man, because the two man tent is a pretty tight squeeze for two people and their stuff. The Coleman Galiano stands up better to rain than any other pop-up I have used and two storage pockets inside that are really a nice added convenience. The Winterial Pop-up tent distinguishes itself by being the most difficult pop-up tent on this list to fold up. However after watching this video on how to set up and take down the Winterial pop-up tent, it was pretty easy to fold up. 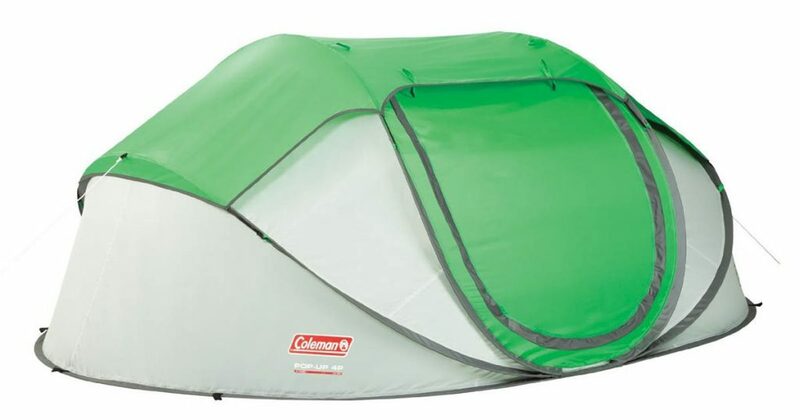 It also does not handle wind and rain as well as the Coleman Galiano Pop-up tent, but it does have windows, and for some reason a lot of other pop-up tents do not. 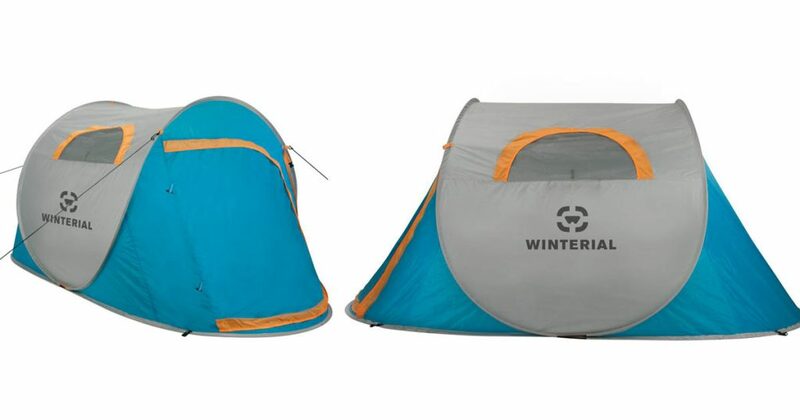 The Winteral also has a fair amount of room for a two man tent, and it is one of the tallest two man tents on the market which is nice when you are changing clothes. So you you want a two man tent, and you don’t plan on camping in the rain this is a great option. If you are looking for a one person “all in one” option for a relatively low price than this is the ideal pop-up tent for you. 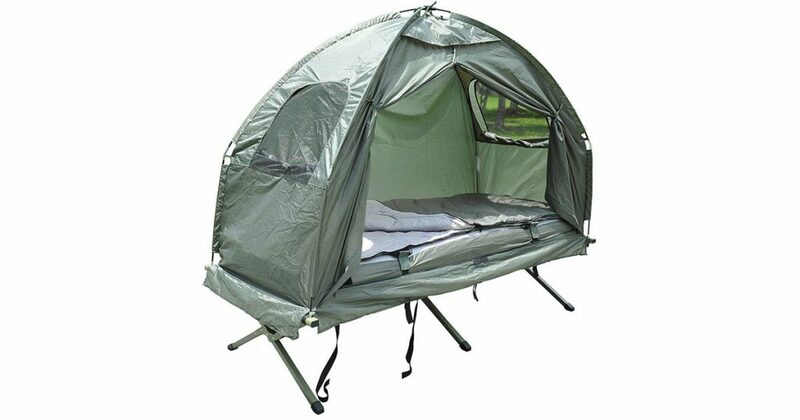 It ships with a cot, tent, mattress and pillow, so all you need is a sleeping bag, and you are ready to go. All of this fits into a heavy duty bag for easy transport. This combo is unbelievably comfortable, so you can expect a great night of sleep. The windows are an added bonus especially in warmer climates. The only drawback is that it may be a bit short for people over 6ft tall, but if you are 5’11” or shorter this is a great one man set up.